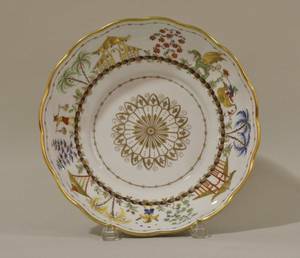 Realized price for French Chinoisserie Bowl. By Tiffany & Company. Center bowl with polychrome figural and architecture decoration. Inscribed in red on base "Tiffany & Co, Private Stock, Hand Painted, Made in France". Diameter 10.5 inches.